Skybird HD includes all Potions found in the game Skyrim. Selecting a Potion using the table will show you the Weight, Value (base value when made with no perks) and the effects which the Potion confers on the Dragonborn. The app will analyse the Potion to identify which ingredients have to be combined in order to re-create the Potion at an Alchemy table, and display these in the main detail pane. 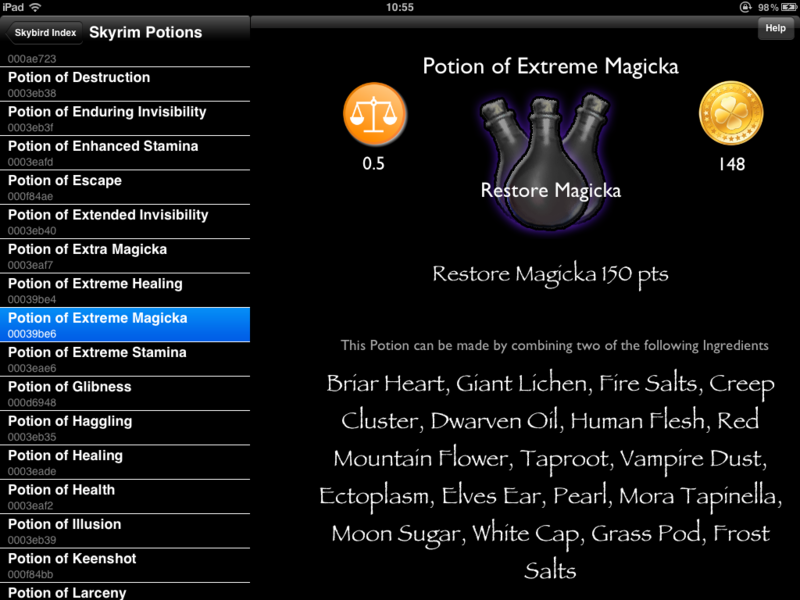 Where a potion has multiple effects, the analyser correctly identifies all ingredients required. 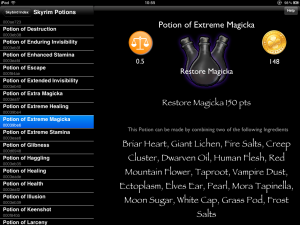 The table also includes the unique item codes for each potion, which will enable you to immediately create the potion at your location, using the in-game console. Full instructions are included with the App. Really straightforward to use, but very powerful.